At Skylake, campers experience a magical environment where they can create happy memories, develop interests and skills, experience personal growth, build friendships, develop confidence and self-expression; all while playing, learning and thriving in our beautiful outdoor playground. Kids spend quality time outside learning new skills and enjoying amazing outdoor adventures with new and old friends. Sleep-away camp at Skylake is a place where kids experience a traditional summer camp life without cell phones, video games or the internet. Skylake is located in the Sierra National Forest on Bass Lake, just 15 miles from Yosemite National Park. Most campers come from the Los Angeles and San Francisco area. About 10% visit from the East Coast and from around the globe. 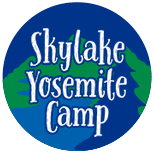 Skylake offers two, four, six and eight week sessions and Family Camp on select weekends! Yosemite National Park Day Trips are scheduled daily and Backpack Trips scheduled weekly for out of camp adventure. Exciting waterfront summer fun from our private docks on sparkling, warm-water, Bass Lake. Campers choose from a variety of land activities each day for endless fun at summer camp.